Happy Monday everyone! I'm trying to work in as many neon colors as I can before Fall officially begins. Although, the other multi-colored option is perfect for transitioning, so I think I may need it too! Also, how adorable is this clutch? 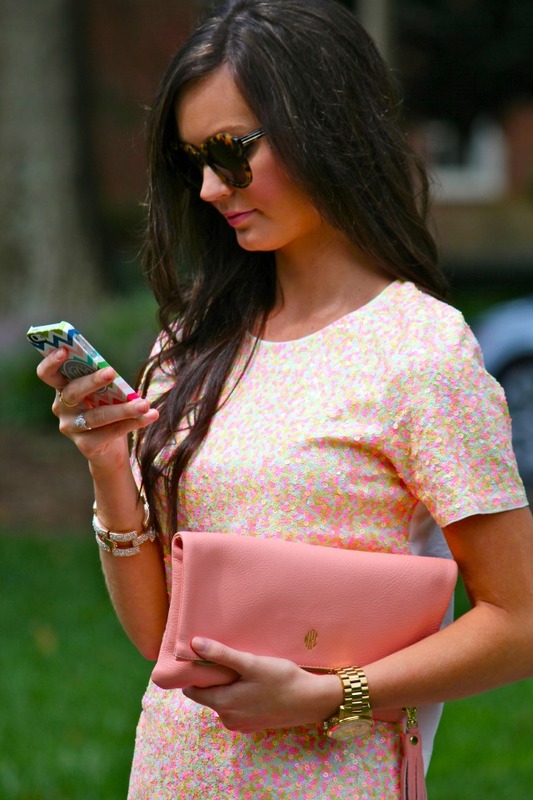 I am absolutely obsessed with it and the gold monogram on the front just adds the perfect touch. So many cute colors to choose from, but the pastel pink is completely my style. I love love love this look! I have that top too and it is so fun! You look amazing! This is such a cute and pretty look!! 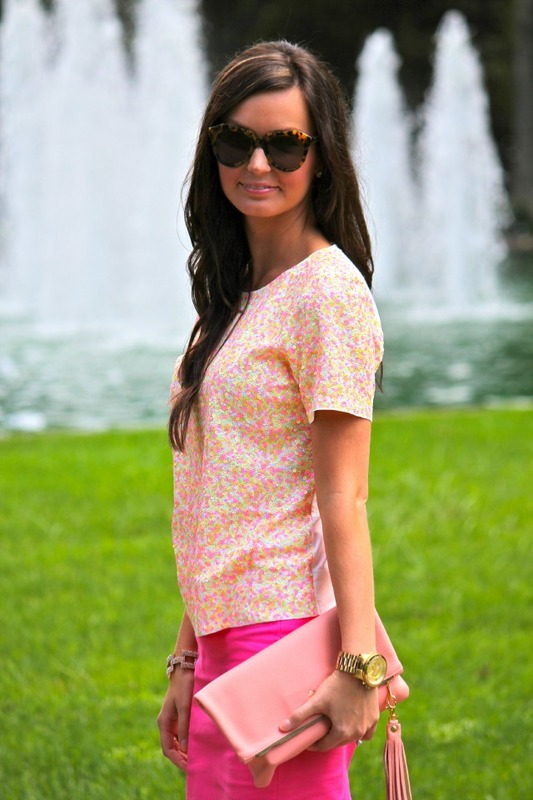 LOVE everything about this outfit, so pretty..
love your pink skirt and purse!! v pretty!! such a bright and colorful outfit! What a gorgeous look! I'm not sure what I adore most about this outfit - the bright colors? the neon? sequins, maybe? - so I'll just say that I love it all! Especially the phone case! Talk about "Cute" with a capital c! I think you may have just inspired me to throw as many brightly colored items as I can into my wardrobe for the next few weeks, too. Love the bright colors!! Such a perfect combo.. and those shoes! obsessed. You did a great job with this look! Normally the thought of sequins and metallics would not work for day time, but the colors and the styling make this look perfect for everyday!! OBSESSING over this top! What a fabulous look! That top is just darling!! And I always swoon over those shoes! 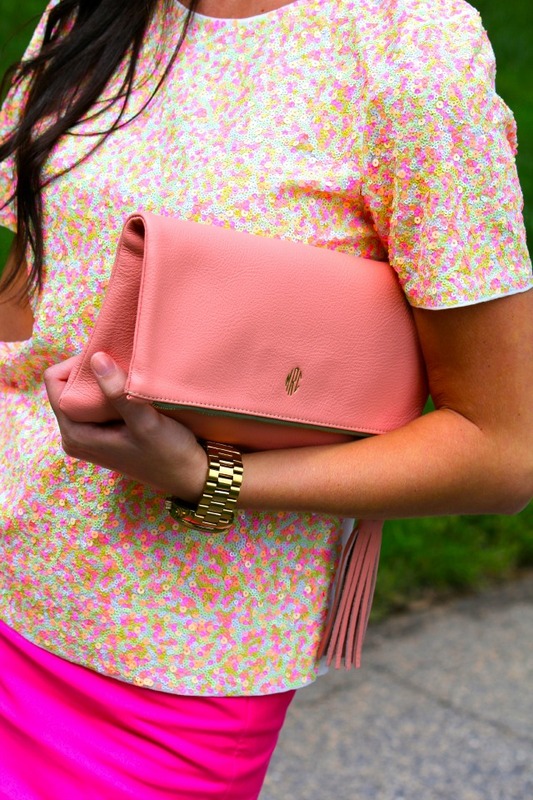 Nice hair and love your clutch!